Salone del Mobile 2018, celebrating its fifty-seventh edition this year, has been a major source of satisfaction for Vismara Design, which has been proving to be an undisputed leader in the production of luxury game tables and exclusive private home theaters from year to year. Another edition of Salone del Mobile has ended “with a bang”. Being full of great satisfactions and surprises, it has enhanced Vismara Design position on the market as uncontested leader of luxury entertainment. The genius of Vismara creations – game tables and turn-key home theatres – has made it a reference point for those wanting to fully enjoy every room in their houses. The final outcome of this edition can definitely be considered a success, both in terms of interest and visitors. The latter, being catapulted in this out-of-the-box atmosphere, have been charmed and amazed by the new products presented by the brand. The real star of this year edition of Salone del Mobile has however been Stadium – the new, long-awaited Vismara Design Foosball Table, which has been appreciated not only for its modern design but also for its ludic spirit. Its uniqueness relies in every single detail, from the gold- and chrome-plated players to the little cork balls. Visitors loved the fact that this product practicality, rather than being compromised, is actually enhanced by some technical features; this is why Stadium is seen, first of all, as a functional piece of design by all the foosball table enthusiasts. Remarkable success for the Home Theater too – given this year special collaboration with an exclusive partner, Samsung Italia. The perfect combination of Vismara recliners design, Samsung Movie Led screen and the Danish Dali Dolby Atmos system has created a true top-class product. The strength of Vismara Home Theater is the comprehensive, 360-degree service that the product can offer, recreating a space where beauty and technological innovation perfectly merge. 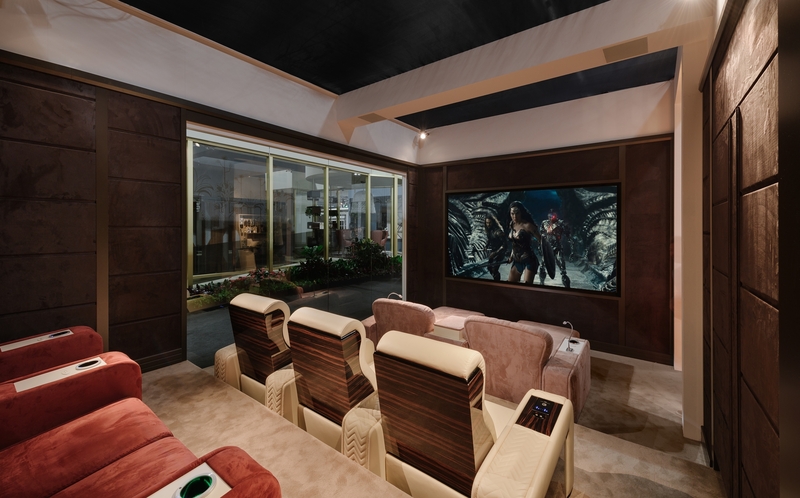 Vismara carefully realised the whole panelling design, whose function is both to hide the speakers and create the typical intimate and cosy atmosphere of luxury home theatres. 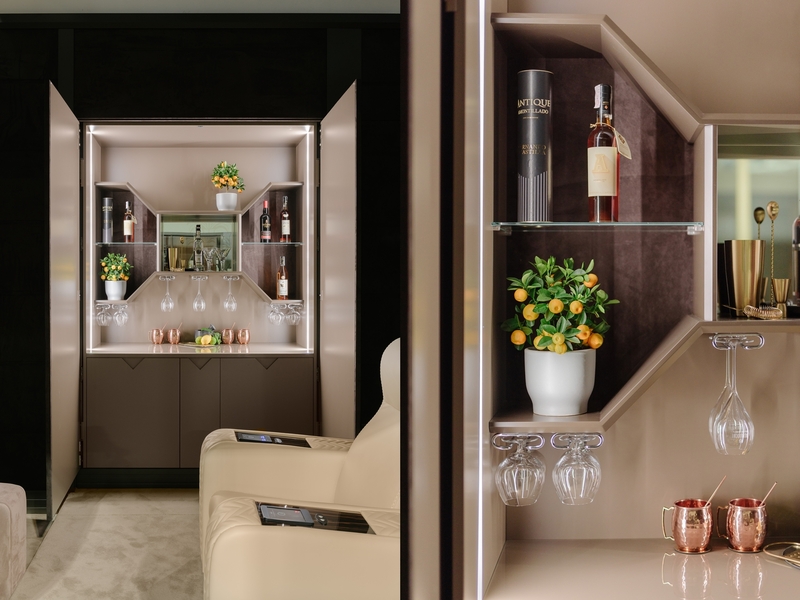 And, joy of joys, there’s also an incredible bar cabinet, fitted with a strategic pocket doors system that can hide the entire piece of furniture inside the panels and disclose it when needed. A fridge, a work table and a specific space where to put one’s equipment make the Home Theater bar a real standout. Thanks to this year incredible turnout, Vismara has further expanded and refined its Luxury Entertainment collection, which is promisingly growing every year. The conceptual association of luxury furniture and private entertainment has proved to be a winner, indeed. 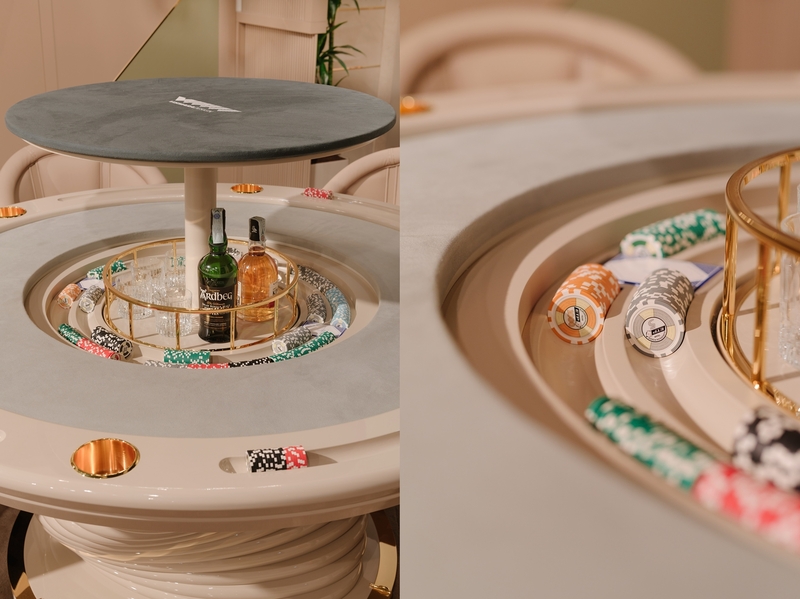 Vismara game tables family keeps expanding too, welcoming even more astounding products such as Mirabilia – a poker table equipped with a motorised bar compartment that can be activated with the remote control, popping up from the centre whenever you may want to use a drink during an engaging poker game with some friends. Vismara Design can then declare itself totally and proudly satisfied with this edition of Salone del Mobile, which remains the biggest and greatest Made in Italy furniture event.